Do I need to become a member of DSRPC before I can use the range on my own? Once I am a member, can my wife or son come to the range with me to shoot? Yes. Members are allowed to bring a maximum of four guests at any one time to the range. Guests must remain with the member, at all times, while on the range facility. When are non members allowed to use the facility? Non members are welcome to participate in scheduled monthly matches held on weekends at the facility. When the daily match is over, non members must leave the property. 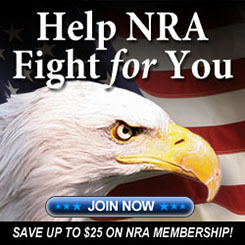 Why do I need to be a member of the NRA before I can apply for membership to DSRPC? Desert Sportsman is an affiliate member of the NRA and as such all members of Desert Sportsman must be current members of the NRA. How do I get an application for membership to DSRPC? Go to the ‘Membership’ link on the web site and download an application package. You can also call the club phone and request an application be sent to you through the mail. When is the range open for shooting? Check the ‘Hours of Operation’ link on the website. What kind of ammunition can I shoot at on the range? Most any rimfire or centerfire cartridge is acceptable. The following ammunition is not allowed – Explosive, Incindiary, Armor Piercing, .50cal M2 (machine gun) and Tracer ammunition. What kind of targets can I shoot at on the range? Most individuals use paper, cardboard or steel. Target materials that ARE NOT ALLOWED include (but are not limited to), bottles, bricks, cinder blocks, televisions, computers, furniture, the trash barrels, tires, oil cans or any other flammables. How do I know if I need to bring my own target stands? Range #6 has 2″ wide concrete slips poured in the ground at distances of 25yds, 50yds, 100yds, 200yds & 300yds. If you intend to use these, your target frames must be made of 2″ by 2″ material or it will not fit. Range #10 has the same set up in some of the shooting bays there. All other ranges on the facility require individual target stands to hold the target frame. Does the club offer business, family or group memberships? No. All memberships in the club are individual. There are no group memberships or group rates. I have been shooting firearms all my life and I am very familiar with firearm safety. Do I need to attend the Range Safety Orientation? Yes. All individuals wishing to become members of the club are required to attend the Range Safety Orientation. Many topics are covered including Club Organization, Administrative Policies, Range Security, Safe Firearms Handling and Range Safety Rules. Do I need to provide my own targets? Yes. DSRPC does not provide targets for individual use. You must have your own! How long will it take to get my membership so I can use the range? Membership processing can take up to eight weeks. This is dependent on timing of when the application is initially received by the club and whether it is properly completed with all documentation included. I want to purchase a firearm. Does the club sell firearms? DSRPC does not sell firearms. We provide a facility where individuals can go to shoot their own firearms. What shooting disciplines does DSRPC offer to shooters? Check out the ‘Current Disciplines’ link on the website. They are all listed there. I am interested in participating in a discipline offered at the range. How do I know what equipment I need to purchase? Check the ‘Activities Calendar’ on the website. Come out to the range when the discipline you are interested in is scheduled to shoot and speak with the Match Director. Many times the Match Directors have extra equipment for first time participants to use. I shot the CMP range today, It was fun, I had to borrow a yellow plastic insert for the chamber to indicate that the rifle was not chambered with a cartridge. The guy next to me had one that fit as if it were a clip with a tag sticking out of the ejection port. My question is, where do I buy this sort of thing? These Empty Chamber Indicators (ECI) are mandatory for every firearm a shooter may bring to the range facility. These safety flags can be purchased most widely at any gun show. Some of the gun shops in town may also carry a variety of these empty chamber indicators. They are also available at the Gate House where you enter the range facility. I currently shoot USPSA at another location but frequently go to Las Vegas to visit family and I would like to shoot USPSA events at your facility if possible. Could I be put on your email list for club activities for IPSC, ICORE or USPSA matches? All disciplines and scheduled matches are listed on the website calendar. DSRPC does not make e-mail notification of events. What type of targets should I use specifically? Are certain dimensions, materials, etc. required? I have paper targets that need to be mounted. I have a 40 caliber pistol and a 22 rifle. What would the target specifications be? Paper and cardboard targets are the most widely used at the range. Some people use steel targets. Dimensions of the target will depend on your shooting activities and distance you are firing from. Targets must be fabricated so that the bottom edge of the target frame is a minimum of 30″ from the ground. Does DSRPC provide target stands, backing, frame, etc.? The club does have target stands and frames with backing material available at the range gate house. These items can be checked out with a cash deposit. If the frame and stand are returned undamaged, you will get your deposit back.